• Automatic updates schedule — All configuration from the System > Maintenance > Updates & releases page, including the release or update level. • Certificates — All configuration from the System > Certificates pages. This setting is replicable. • Message censor — All configuration from the Services > Message censor pages. This setting is replicable. • Remote Access — All configuration from the System > Administration > Admin options and System > Administration > Administrative users pages. This setting is replicable. • Report templates — All report templates, including any custom report templates from the Reports > Reports > Reports page. This setting is replicable. • Reporting Database Settings — All configuration from the Reports > Settings > Datastore settings page. • Safeguarding — All configuration from the Reports > Safeguarding > Notifications page, and Reports > Safeguarding > Exclusions page. • System Replication Settings — All configuration from the System > Central management pages, and the System > Hardware > Failover page. • System Services — All configuration from the Network > Configuration > DNS page. This setting is replicable. • Tenants — All configuration from the System > Administration > Tenants page, if licensed. This setting is replicable. • Uninteruptable [SIC] Power Supply (UPS) — All configuration from the System > Hardware > UPS page. This setting is replicable. • User Portal — All configuration from the Services > User portal pages. This setting is replicable. • Auth settings — All authentication configuration from the Services > Authentication pages with the exception of the BYOD and Chromebook pages; these have separate options. This setting is replicable. • BYOD settings — All BYOD configuration from the Services > Authentication > BYOD page. This setting is replicable. • Google authentication / Chromebook settings — All configuration from the Services > Authentication > Chromebook page. 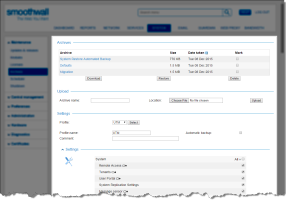 • Bandwidth Management management settings — All configuration from Bandwidth Management > Control pages. This setting is replicable. • Alert settings — The configuration from the Web filter violations, and Web filter URL violations alerts (Reports > Alerts > Alert settings). • All customized categories and content modifications — All customized content, including content from the blocklist, Guardian > Policy objects > Categories, and Guardian > Content modification > Content modifications pages. This setting is replicable. • Authentication Exceptions — All configuration from the Web proxy > Authentication > Exceptions page. This setting is replicable. • Authentication policy — All authentication policies configured in the Web proxy > Authentication pages. Also the configuration from the Web proxy > Web proxy > Automatic configuration page. This settings is replicable. • Global Proxy settings and certificates — All configuration from the Web proxy > Global proxy pages. This setting is replicable. • Log retention — The configuration for the web filter and search terms logs. • MITM certificates — The HTTPS inspection certificates (Guardian > HTTPS inspection > Settings). This setting is replicable. • Machine-specific proxy settings — All Web proxy configuration that are for the hardware running this instance of Smoothwall, such as, the interface address for the automatic configuration script address, and the interface address for the manual web browser proxy settings. • MobileProxy server — All MobileProxy configuration from the Web proxy > MobileProxy pages. • Proxy — All generic web proxy configuration from the Web proxy pages that are not backed up by Machine-specific proxy settings. This setting is replicable. 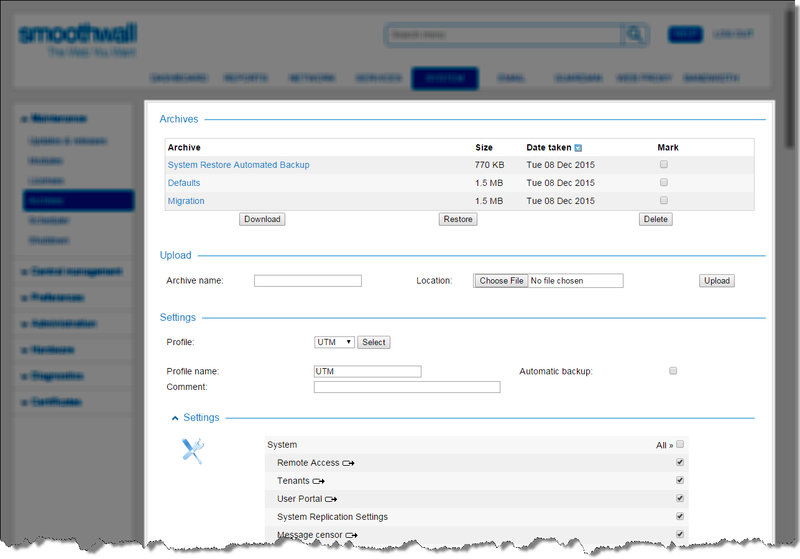 • Smoothwall Connect v3 Proxy settings — All configuration from the Web proxy > Global Proxy > Settings. • Swurl credentials — All configuration from the Guardian > Swurl > Settings page. • Upstream proxies — All upstream proxy configuration from the Web proxy > Upstream proxy pages. This setting is replicable. • Web Cache Communication Protocol (WCCP) — All configuration from the Web proxy > Web proxy > WCCP page. This setting is replicable. • Intrusion Detection settings — All configuration from the Services > Intrusion system > IDS page. This setting is replicable. • Intrusion Prevention settings — All configuration from the Services > Intrusion system > IPS page. This setting is replicable. • Intrusion System Policies and Signatures — All configuration from the Services > Intrusion system > Policies and Services > Intrusion system > Signatures pages. This setting is replicable. • Output Settings — All email and SMS configuration for the alerting and reporting module, from the Reports > Settings > Output settings page. This setting is replicable. • User and Group Settings — All reporting group configuration from the Reports > Settings > Groups page, including user-to-alert and user-to-report allocation. This setting is replicable. • Reverse Proxy settings — All configuration from the Services > Proxies > Reverse proxy page. This setting is replicable. • Routing settings — All configuration from the Network > Routing > RIP page. This setting is replicable. • Group — All configuration from the Network > Settings > Port groups page. This setting is replicable. • Port lists — All configuration from the Network > Outgoing > Ports page. This setting is replicable. • Service lists — All configuration from the Network > Outgoing > External services page. • Sources and Destinations — All configuration from the Network > Outgoing >Policies page. This setting is replicable. • SIP proxy settings — All configuration from the Services > Proxies > SIP page. This setting is replicable. • SNMP settings — All configuration from the Services > SNMP > SNMP page. This setting is replicable.